Robin Takes Five is a recipe book created by Robin Miller, food writer, nutritionist and author of the best-selling cookbook “Quick Fix Meals”. The book features 500 recipes containing less than 500 calories with five ingredients or less. It is designed to help busy people get a healthy, quick meal on the table for weekday dinners. Miller provides 500 options for dishes you can prepare for your friends and family as an alternative to convenience meals. All of the recipes contain five ingredients or less and take no more than twenty minutes to prepare. The author draws attention to the very high amount of sodium that is present in processed foods, prepared meals and those from restaurants. Excess sodium can cause hypertension, heart attacks, strokes and kidney failure and is an important health concern, she explains. While all of her recipes cannot be considered low sodium the book does include many dishes that contain 500mg of sodium or less. A range of globally inspired recipes are provided such as Mexican, Italian, Chinese, Japanese, Indian, Mediterranean, Southwestern and home-style American. The dishes include soups, stews, pizzas, pasta, rice, chicken, beef, pork, seafood, side dishes, and desserts. Vegetables, fruit, black beans, chicken, turkey, seafood, beef, pork, pasta, rice, frozen pizza dough, frozen pie crust, whole wheat tortillas, goat cheese, low fat Mozarella, low-fat milk, half-and-half, peanuts, cashews, reduced-sodium chicken broth, light mayonnaise, olive oil. Robin Takes Five is a cookbook and does not include exercise recommendations. 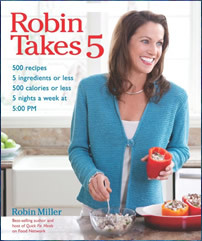 Robin Takes 5: 500 Recipes, 5 Ingredients or Less, 500 Calories or Less, for 5 Nights/Week at 5:00 PM retails at $29.99. Click Here to purchase this cookbook for a discounted price. Offers a healthier alternative to fast food, takeout or frozen convenience meals. Nutritional information and cooking time is provided for every recipe. Many of the recipes are low in sodium. Meals are suitable for lunch, dinner, snacks and desserts. May be necessary to prepare more than one recipe to create a complete meal. Some of the recipes contain unhealthy ingredients such as frozen pizza dough, prepared sauces, frozen pastry, sugar and sweetened dessert items. Does not include many recipes suitable for breakfast. Robin Takes Five provides lots of options for busy weeknight meals that will appeal to the whole family, offering an alternative to takeout or convenience food. While most of the recipes feature healthy ingredients there are also some that contain processed items. So dieters concerned about sugar, refined flour and sodium intake should avoid or limit most of the pizza and dessert recipes.